Where in the world is an edge data center? That's a question IT pros might ask, as more companies try to define where these facilities are located and who uses them. Edge data centers may soon be pushed even closer to the limit. A plan to build colocation data centers at the base of cellphone towers could benefit some enterprises with specific needs for remote data collection and application performance, but it may be too far afield for most enterprises, as they map the borders of edge computing. Project Volutus from Vapor IO envisions thousands of CPUs in a colocation data center space at the base of cellphone towers to increase compute power and proximity to edge networks. Users provide the hardware and lease floor space and power from Vapor IO, along with access to open source software -- OpenDCRE -- that provides telemetry data. "The connection between the edge and cell towers is not coincidental. It is definitely something we anticipate will be part of an edge rollout," said Kelly Quinn, a research manager for data center trends at IDC. "The work that went into placing cell towers already included the work to figure out where it is best to reach people." Project Volutus initially targets large cloud providers, carriers and web-scale companies that don't have access to wireless network locations and don't want to manage their own remote data center facilities. Telecommunications companies will likely be most attracted to these cell-tower edge data centers to get better proximity to end users by connecting to mobile phones and wireless sensors. However, some enterprises might want to get as close to end users as possible, especially in dense, urban areas, Quinn said. A retail bank, such as Citizens Bank or TD Bank could occupy a few racks in these new edge data centers to reach the most people in the least amount of time. Project Volutus supports an application tier that requires low latency and high performance closer to the user, so it's a good fit for companies with cloud-native applications in healthcare, entertainment, manufacturing and logistics, said Cole Crawford, founder and CEO of Vapor IO in Austin, Texas. "We want the industry to stop thinking about the regional data center as the data center," he said. "The fact that the world runs on REST means that applications can run on a variety of data sources." The connection between edge and cell towers is not coincidental. It is definitely something we anticipate will be part of an edge rollout. Most enterprises won't need to locate hardware at cellphone towers -- to these companies, the edge data center will be at moving points closest to data collection, such as a retail store floor or in a transportation company's truck, Quinn said. Enterprises that want to get closer to internal users are more likely to take space in a regional data center, lease lit fiber and hope that path is close enough to customers, she said. Another option for companies that require an edge location is container data centers that can be hauled out to remote areas. For example, last year, Schneider Electric and Hewlett Packard Enterprise introduced a preconfigured, micro-modular data center that combines data center infrastructure management with HPE hardware and software. The new Vapor IO edge data center doesn't yet have any customers, and an early access program is scheduled to start later this summer. Crown Castle, the largest wireless infrastructure company in the United States, has a minority investment in the project. The exact definition of an edge data center is still up for interpretation, whether it is a regional data center, a cellphone tower or remote location such as an oil and gas platform in the Gulf of Mexico. 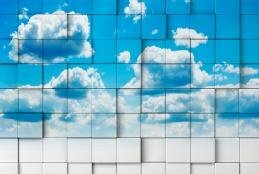 Nearly half of data center operations professionals in an IDC survey earlier this year agreed with the definition of "a mesh network of micro data centers that process and store critical data locally and push all received and/or computed data to a central data center or cloud storage repository." Another 38% saw it as a "spoke-and-wheel" topography, where small-footprint data centers in remote locations feed data back to a central data center to process and store it. The edge is now broken up into three types of edge data centers, according to Steven Carlini, senior director for data center global solutions at Schneider Electric. These telco-centric edge data centers are one category, but most of these deployments won't happen until a broader rollout of 5G networks that that can cache and quickly deliver lots of data and content, he said. There's also the industrial edge, which includes pipeline management, oil and gas exploration, and farms and vineyards, and the local edge to process internet of things and big data on the edge and send a subset of data back to the regional edge where the cloud lives. Where are your company's edge data centers located, and why? To get closer to customers, more businesses are taking data center technologies all the way to the edge. Here's what it takes to actually make that happen. To really make IoT and similar edge computing initiatives pay off, an IT organization needs to distribute essential data center resources far and wide. With the rise of IoT, more organizations are considering an edge data center. The SearchDataCenter Advisory Board predicts the biggest benefits and challenges IT teams will face. Where are your company's edge data center(s) located, and why?